The Braithwaite Hall is situated in the peaceful conservation village of Far Sawrey, in the heart of the beautiful Lake District, only a 10 minute walk from the famous home of Beatrix Potter, creator of Peter Rabbit. It is just a short walk to Lake Windermere and Esthwaite Water, with numerous footpaths and mountain bike trails nearby. Opposite the Hall is a hotel with inn, offering food, drink and accommodation and there are numerous guest houses and B&Bs nearby. Visitors are within walking distance to the Bowness Ferry and only a few miles away from the famous Lakeland towns of Hawkshead, Coniston, Ambleside and Bowness- on- Windermere with many places of interest. 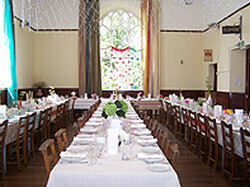 The Hall is surrounded by stunning scenery and is in a dream location. It is positioned in an acre of lawns with car park, including disabled parking and disabled access. It is ideal for family functions, receptions, fundraising events, club meetings, exhibitions & trade fairs, badminton and workshops. It can also be hired by groups seeking budget accommodation who would like to camp out in the main room. It is available for hire seven days a week at very inexpensive rates. 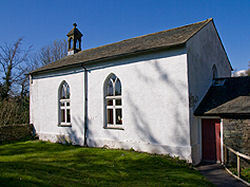 The Braithwaite Hall was built in the mid 1700s and is complete with small bell tower.